Battling a visual handicap, an 84-year-old Vedic scholar in Pune has composed “Bhimayanam” , the first ever biography of the architect of Indian constitution and icon of the underprivileged Dr. B. R. Ambedkar in Sanskrit verse. The exceptional feat of Prabhakar Joshi, who lost his sight completely while still working on the biography undertaken in 2004, stands as a testimony to his unflinching determination and will power that saw recent publication of the book containing 1,577 Sanskrit ‘slokas’ covering the life span of Dr. Ambedkar unfolded in 160 pages with 21 ‘Sargas’ (chapters). A victim of glaucoma, Mr. Joshi who has an illustrious background as a teacher of Sanskrit in schools and colleges, was immensely influenced by Dr. Ambedkar’s mission to uplift the downtrodden. When he started studying Dr. Ambedkar’s life, he came across certain facts that inspired him to take up the unique project of his Sanskrit biography titled “Bhimayanam“. “Not many people know that it was an ardent desire of Ramji, father of Dr. Ambedkar, that his son should learn Sanskrit. 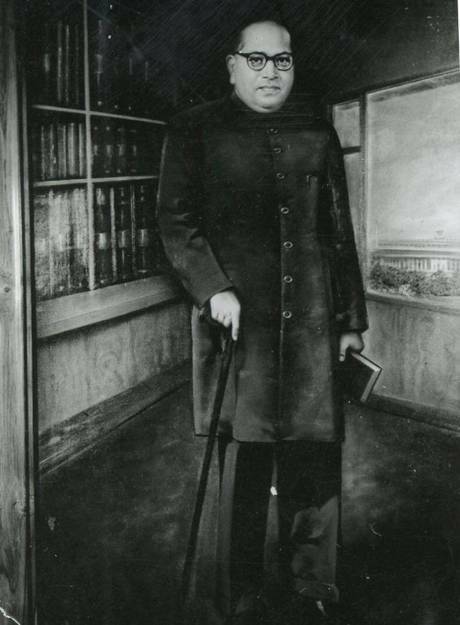 When Dr. Bhimrao Ambedkar opted for the subject after being enrolled in the Elphinstone High School in Mumbai, he was in for rude shock as the teachers there refused to allow him to study Sanskrit because he was a Dalit. Imparting knowledge of Sanskrit to ‘lower caste’ students those days was something to be frowned upon”, Mr. Joshi said. After pondering over this episode, Mr. Joshi thought of an “atonement of sorts” by way of versifying in Sanskrit, the life of Ambedkar whom he reverently calls ‘Mahamanav’. A progressive glaucoma started affecting the vision of the octogenarian even as he persisted with his writing, at times overlapping words as a result of poor eyesight. “I was losing my vision fast but my resolve to complete the work was getting firmer notwithstanding the visual handicap. My wife read the lines I had written and made them legible for further processing. Many times, I got up in the middle of night to write the words that came to my mind without knowing that ink had dried,” Mr. Joshi who has retained all his faculties at the ripe age recalled. Explaining his method that led to completion of his work, he said “I first summarised important milestones in Ambedkar’s life and then got it taped. Then I kept listening to the audio again and again, pondering over my next verse“. According to Mr. Joshi, who taught Sanskrit at Fergusson College here and was a guide at Pune University for many students doing their doctorates in Sanskrit, Dr. Ambedkar was a great supporter of the language which he regarded as mother of most of the regional tongues in the country. Despite his strong opposition to the Brahminical dominance in the society and social discrimination that led him and his followers to embrace Buddhism, Dr. Ambedkar himself had mastered Sanskrit, which was identified with the upper caste, he said. “Bhimayanam” was published under “Sharada Gaurav Granthamala” series by Pandit Vasant Gadgil after six years of dedicated work by Mr. Joshi, a recipient of Maharashtra government’s ‘Mahakavi Kalidas’ award. As Mr. Joshi spoke, his unseeing eyes stared in a fixed gaze. But the words came gushing lighting up his face as he dealt on the towering personality so dear to his heart — Dr. Babasaheb Ambedkar who bestowed dignity on those who suffered from injustice.